Matthew Heimbach, center, voices his displeasure at the media Monday after a court hearing for James Alex Fields Jr. in front of court in Charlottesville, Va. A judge denied bond for Fields accused of plowing his car into a crowd at a white nationalist rally. BIRMINGHAM, Ala. — Emboldened and proclaiming victory after a bloody weekend in Virginia, white nationalists are planning more demonstrations to promote their agenda after the violence that left a woman dead and dozens injured. The University of Florida said white provocateur Richard Spencer, whose appearances sometimes stoke unrest, is seeking permission to speak there next month. White nationalist Preston Wiginton had said he was planning a “White Lives Matter” rally at Texas A&M University in September, but the university later said it has been canceled. Also, a neo-Confederate group had asked the state of Virginia for permission to rally at a monument to Confederate Gen. Robert E. Lee in Richmond on Sept. 16, but later canceled its plans. Organizer Bragdon Bowling told media outlets Tuesday that Americans for Richmond Monument Preservation is pulling its permit request for the Sept. 16 rally in light of the violence in Charlottesville, Virginia. Bowling filed the permit request weeks before the Charlottesville rally. Other events are likely to be held. “We’re going to be more active than ever before,” Matthew Heimbach, a white nationalist leader, said Monday. James Alex Fields Jr., a young man who was said to idolize Adolf Hitler and Nazi Germany in high school, was charged with killing a woman by slamming a car into a group of counter-protesters at a white nationalist rally Sunday in Charlottesville, Virginia. Fields, 20, who recently moved to Ohio from his home state of Kentucky, was held without bail on murder charges. He was photographed at the rally behind a shield bearing the emblem of the white nationalist Vanguard America, though the group denied he was a member. Two state troopers also died Sunday when their helicopter crashed during an effort to contain the violence. The U.S. Justice Department said it will review the violence, and Attorney General Jeff Sessions told ABC the death of counter-protester Heather Heyer, 32, met the definition of domestic terrorism. White nationalists said they were undaunted. 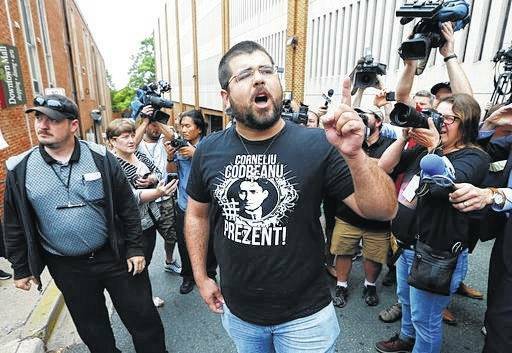 Heimbach, who said he was pepper-sprayed during the melee in Charlottesville, called the event Saturday “an absolute stunning victory” for the far right because of the large number of supporters who descended on the city to decry plans to remove a statue of Lee. Hundreds of white nationalists, white supremacists, neo-Nazis, Ku Klux Klan members and others were involved, by some estimates, in what Heimbach, leader of the Traditionalist Workers Party, called the nation’s biggest such event in a decade or more. Even more opponents turned out, and the two sides clashed violently. A neo-Nazi website that helped promote the gathering said there will be more events soon. “We are going to start doing this nonstop. Across the country,” said the site, which internet domain host GoDaddy said it was shutting down after it mocked the woman killed in Charlottesville. The head of the National Socialist Movement, Jeff Schoep, said Charlottesville was a “really good” white nationalist event that was being overshadowed by the deaths. “Any time someone loses their life it’s unfortunate,” he said. He blamed the violence on inadequate police protection and counter-demonstrators and said he doubts white nationalists will be deterred from attending more such demonstrations. Preserving memorials to the Old South has become an animating force for the white nationalist movement, not because all members are Southern, Schoep said, but because adherents see the drive to remove such monuments as part of a larger, anti-white crusade. “It’s an assault on American freedoms. Today it’s Confederate monuments. Tomorrow it may be the Constitution or the American flag,” Schoep said. At the University of Florida, where Spencer has asked to speak, President W. Kent Fuchs called the events in Virginia “deplorable” but indicated school officials might be unable to block his appearance. “While this speaker’s views do not align with our values as an institution, we must follow the law, upholding the First Amendment not to discriminate based on content and provide access to a public space,” Fuchs said in a message on the university’s Facebook page. Auburn University spent nearly $30,000 in legal fees in an unsuccessful attempt to prevent Spencer from speaking on its campus in Alabama in April.